As a very “religious” island, Lombok is home to many temples, and they all have a special place in the hearts and minds of the locals. You might already know that the Sasak people make up 80+ percent of the island’s population. At the same time, the Hindu people also have a strong presence, and the Gunung Agung temple is slowly becoming one of the most popular tourist spots. It’s located in the Gunung Sari village, and I’ll take you on a journey through this settlement to the Pura. The village is very colorful, even though the men and women are used to a modest lifestyle. The kids are adorable; especially the ones that come up to you and start talking with a funny accent. Yes, some of the locals know English, which is a pleasant surprise, as most of the island’s population can’t even say two words in a foreign language. Gunung Sari sits right “on top” of Mataram, the biggest city in Lombok, and I encourage you to take a moment to admire the view. The route from the city to the temple is covered by rice fields and some of the most beautiful flowers, bushes, and trees. The farmers work in the fields to provide for their families, and, even though it gets tough sometimes, this fertile land gives them the necessary strength to go on. This place feels like Heaven on Earth, like many other areas in Lombok. The Sasak folks call this temple “Agung Gunung Sari”, adding the name of the village as a reminder of its location. For the Hindus, it’s just Gunung Agung. According to the historians (and some legends), it was built back in 1717, more than 300 years ago by Anak Agung. It was his way of showing gratitude to the all-powerful gods for protecting him on every step of the way. As the captain of a large army, he charged his man into a battle against the Banjar Getas and won the fight against all odds. But before he even gave the command to attack, Anak visited one of the praying spots on the Agung Mountain to beg his gods for protection. On the way back, the man felt the need to immortalize his victory. 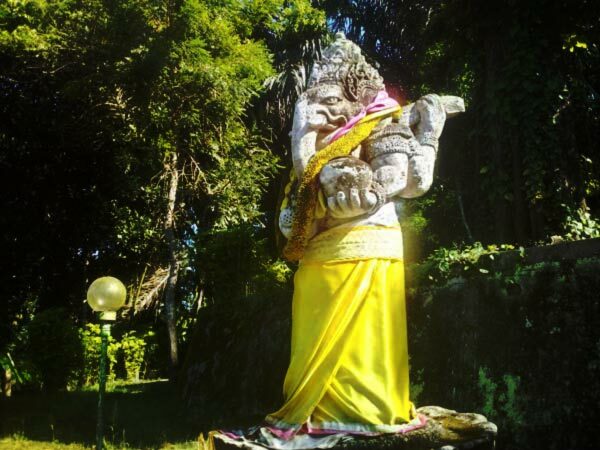 So, he stayed in Lombok and built the temple – Gunung Agung. Now, the Hindu people are very open and friendly, and they encourage foreigners to learn more about their customs, traditions, and places of worship. However, this landmark is not that easy to find, and it sometimes it feels like they deliberately “hid” it from the public eye. Only a small number of tourists know about it, but every single person is welcome to visit. There’s a very strong spiritual atmosphere inside the building, almost like you’re entering a different dimension. The smell of flowers is very strong and has a calming effect. Gunung Agung is a magical place, no doubt about it. As we just learned, it’s been around for three centuries, and still stands like all those years ago. You can just do some “basic sightseeing” or enter the temple and see what it’s all about. I highly recommend stepping into this holy place and opening yourself up to it. As soon as you enter Madya Mandala, the temple’s gate, you might notice some folks preparing their offerings to the gods. Utama Mandala is where the majority of people pray. It’s the biggest and main part of Gunung Agung. Inside, the temple is very impressive and, even though the visitors aren’t allowed to take pictures without a permit, people do that all the time. Also known as Pura Agung, it is one of those landmarks that you simply have to visit when you’re in Lombok for a week or so. If you’re renting a room in Mataram, pick a sunny day to admire the temple. Fact: in the city, everything is considerably pricier, which means it might be a good idea to rent a guest room in the neighboring villages. The rates change all the time; so, make sure to take care of accommodations before you land on the island. Generally speaking, 10-15 dollars a day should be more than enough to rent a room for a day. Food is also cheap in the surrounding areas. Plus, you’ll get to enjoy the beautiful nature instead of seeing regular buildings from the window. The Gili Islands right next to Lombok are great for partying (especially Trawangan), but they are not suited for family visits. Same goes for the scary shark market. Gunung Agung, however, is just the right pick if you want the little ones to accompany you on this sightseeing tour. Experiences like this one have a much stronger impact on the kids than the grown-ups. The buildings inside the temple’s territory are very impressive and make you wonder how the Hindus managed to build them in the 18th century. If you’re a fan of lush green areas, there is an amazing park in the back that will serve as a wonderful spot to rest and take everything you just saw in. The majority of temples in Lombok are built by the Sasak people. That makes landmarks like Gunung Agung unique. Some folks like to visit as many tourist spots during their trips as possible so that they can take tons of pictures and brag about them at home. Now, while that is fun in some ways, a visit to this island should be about more than that. I bet after reading this review you’ll appreciate this temple more and will want to spend at least a couple of hours there and see everything with your own eyes. Located just above the beautiful Gunung Sari hills, it’s got a humbling effect. Deep in the woods, it feels like you’re totally alone, away from civilization. Yes, in contrast to the rest of the landmarks in Lombok, it’s not that easy to find (even though it is super close to the biggest city). Peace, comfort, and tranquility – that’s what you’ll find when you step through the gates of Pura Gunung Agung. See those huge statues standing in the left and right corners? Ganesha and Goddess Uma play important roles in the Hindu religion. Uma, for example, brings love, devotion, and fertility to those that serve her the right way. Ganesha, in turn, is not only worshipped in Indonesia, but also in India, Nepal, and other countries. The throne of Acintya, the Supreme God, sits right in the middle. The famous bamboos are a sight for sore eyes. Shut down your car/motorbike for a second and pull out your phone: this view is worth taking a thousand pictures! The route from Mataram to our destination will take no more than 15 minutes. Yep, it’s that close, and I highly recommend driving a regular bike to get there. That is, if you’re up for the rough workout, of course. There are eight kilometers between the city and Gunung Agung, and I had no problem riding myself to the top. Take your time with it. If you’re not alone on this trip, then you don’t need me to remind you how much more fun and thrilling this ride will be. Now, there are many tours available online that promise all kinds of treats like ‘hidden” pathways, various activities, hotel room booking, etcetera, etcetera. But in all fairness, a regular tourist doesn’t really need any of that, simply because the village and the Gunung Agung temple are very close to Mataram and it’s almost impossible to get lost. The locals are all nice people, and I can say with certainty that the staff at the hotels, guest houses, and renting companies understands English and will show you the right way. As for the route from the Lombok Airport to the big city, it’s best to enjoy it in the back seat of a taxi. Don’t be greedy: it will be worth every last penny. Usually, the drive takes 45-60 minutes, and these 40 kilometers will give you a chance to do some sightseeing and get a sense of what the island is all about. I paid the man 60 thousand IDR, but that’s not actual info, as the rate change all the time. Keep that number in mind as a good “reference point” – nothing more, nothing less. Oh, and please remember that no public transport will take you directly to the temple, which is why renting is your only option on the road to Gunung Agung. Once you’re in Gunung Sari, the village, turn right two times. Soon, you’ll arrive at the temple’s doorstep. Just like the author mentioned, this temple is very humbling and calming, almost like it connects with you on a spiritual level. The airport ride cost us a bit more than what you said, but in US dollars, it was the cheapest ride in my life! This temple is worth a visit. But I wouldn't say it's the most amazing Pura on the island. The Hindu temples are very impressive. I've been around the world and can say with certainty that there's something unique about them. Honestly, Lombok is one of the most children-friendly resort islands in the world. The locals are nice, and the crime rate is extremely low. Too bad there's tons of trash here and there. The city and the Temple were super-clean, that's true. We booked a room in Mataram for the whole family and had absolutely no problem finding Gunung Agung. Inside, everything is nice and clean; the statues are majestic, to say the least.